People seem to enjoy spherically shaped foods from falafel to mozzarella balls or chocolate truffles to blueberries, these perfect bite-sized morsels delight the multitudes—and meatballs are no exception. Comforting, savory meatballs are always a hit at the family dinner table. This recipe for well-seasoned meatballs with gravy goes well alongside hot cooked noodles, mashed potatoes, or rice. This is a classic American preparation for meatballs, but the history of meatballs goes back at least 2,000 years. Both the ancient Chinese and ancient Romans had recorded recipes for meatballs in their archives. Nearly every culture across the globe has a variation of meatballs as a regional food. Although many have tried Swedish meatballs in the U.S., kofta in the Middle East and South Asia and albondigas in the Spanish-speaking world are perhaps even more pervasive throughout the world. In a large bowl combine ground beef and ground pork with the milk, egg, bread crumbs, chopped onion, bell pepper, ketchup, parsley, salt, and pepper. Shape into large meatballs, about 1 1/2 inches in diameter. Put the meatballs in a container; cover and refrigerate for at least 1 hour. In a large skillet or saute pan over medium heat, heat the oil. Brown the meatballs, turning carefully to brown all sides. When the meatballs are firm and well browned, add the beef broth. Cover, reduce the heat to low, and cook for 45 minutes, or until meatballs are cooked through. 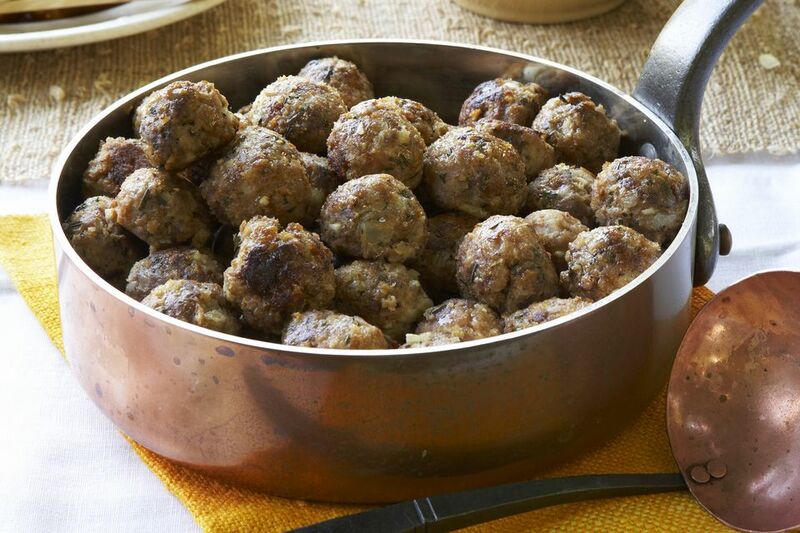 With a slotted spoon, remove meatballs and place in a warm bowl or platter and keep warm. For gravy, add the flour and water mixture to the drippings. Cook, stirring, until thickened. Cooking method: Meatballs can be cooked by frying, baking, steaming, or braising in sauce. The key with meatballs is to not let them dry out. When you brown the meatballs in a frying pan, it seals the juices in. When baking, steaming, or braising, these cooking methods (usually covered) seal in moisture. Spice it up: You can get unique and play around with adding spices like paprika, oregano, or cumin. Get lean: If you are looking for a leaner meatball, substitute half of the ground beef for chicken or turkey and do the same with the ground pork. Fridge storage: Properly stored, cooked meatballs will last for 3 to 4 days in the refrigerator. Refrigerate meatballs within two hours of cooking. Store in shallow airtight containers or wrap tightly with heavy-duty aluminum foil or plastic wrap. Freezer storage: Freeze in covered airtight containers or heavy-duty freezer bags or wrap tightly with heavy-duty aluminum foil or freezer wrap. Properly stored, they will maintain best quality for 3 to 4 months. Kept constantly frozen at 0 F, the meatballs can keep indefinitely (although may start to lose some flavor over time). Thawed storage: Cooked meatballs that have been thawed in the fridge can be kept for an additional 3 to 4 days in the refrigerator before cooking. Spoilage: Bacteria grow rapidly at temperatures between 40 F and 140 F; cooked meatballs should be discarded if left for more than 2 hours at room temperature.